We offer a variety of classes and activities at our markets to empower the next generation of healthy eaters and farmers market shoppers! Kids Cook at the Market is a summertime program that gives junior chefs ages 7 to 12 the opportunity to learn about the seasonality of food, meet local farmers, and prepare ingredients purchased fresh from the market. Tickets are $10 per child, per class ($5 per child for SNAP recipients). Sunday, June 30: Hand Pressed Tortillas = Veggie Tacos! -Tickets are nonrefundable but you may transfer your registration to another family. -All classes will have a gluten free and dairy free option. -Classes last approximately 60 minutes. -Please note that this is the same program that was previously offered at the PSU Market. We have a grant supporting the Lents International Farmers Market that allows us to provide these classes to the community for free, though registration is required. Please RSVP below. Sunday, July 28: Hand Pressed Tortillas = Veggie Tacos! Food Scouts – back for 2019! 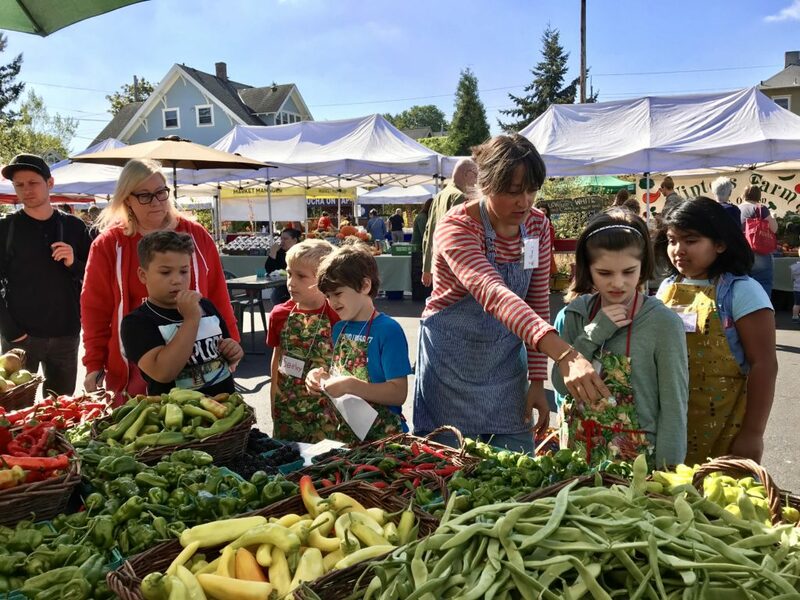 Food Scouts is an innovative partnership between Zenger Farm and Portland Farmers Market that empowers the next generation of eaters by giving children aged 3-12 years old $2 is market tokens to spend on fresh produce each week. Scouts also participate in weekly interactive activities centered on good food and nutrition, and learn more about their role in shaping their local food system. OSU Extension Service will provide free, hands-on cooking activities for youth of all ages every Wednesday, June through August. They’ll use Food Hero recipes to highlight produce available at the market. Free to participate, drop by anytime between 3:30-7 p.m.
Portland Farmers Market invites families with kids of all ages to participate in the annual Great Pumpkin events, on the Saturday (PSU) and Sunday (King) prior to Halloween. These Halloween harvest celebrations will be filled with fun for shoppers of all ages, including costume parades, pumpkin carving, and goody bags.